It must be frustrating to be a well-regarded author whose works become eclipsed by the writings of a pseudonym. Inger Ash Wolfe, Michael Redhill’s pseudonym, found an American audience. Michael Redhill has not. Both authors are better known in Canada, home to both Redhill and his nom de plume. And that may be a problem — an identity crisis — that has driven Redhill to write “Bellevue Square,” apparently the first in a “triptych of novels called Modern Ghosts.” Redhill seems to be haunted by his own creation. Redhill essentially disables his alter ego in this book. If this presages no more books by Wolfe, I will mourn her death. I am enamored of Wolfe’s quirky, entertaining, often gruesome crime books. 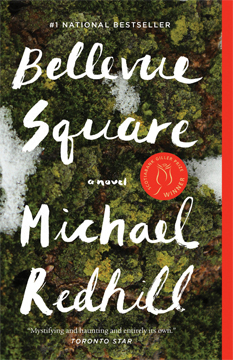 By winning the lucrative Canadian Scotiabank Giller Prize for “Bellevue Square,” has Redhill received establishment permission to permanently partition off a part of himself, to professionally murder Inger Ash Wolfe? Jean Mason, the main character in “Bellevue Square,” begins life as a normal, somewhat boring bookstore owner in Toronto with an ex-police officer husband and two young sons — formerly of the same town as Inger Ash Wolfe’s protagonist Hazel Micallef. In increasingly bizarre and anxious revelations, Jean becomes aware of a doppleganger afoot in Toronto, the elusive Ingrid Fox. Who is she becomes what is she. Well, she apparently is the first “modern ghost” of Redhill’s intended future opus. There are seizures, hospital stays, an ineffective therapist, and baby Aspirin — medical red herrings to explain Jean and her twin, perhaps? Or does Redhill go down a bumpy horror or science-fiction road? I guess we’ll have to wait for the rest of the “triptych” to reveal the underlying theme. My sense that doom hangs large over Inger Ash Wolfe leads me to give a puzzled thumbs down to a book that as far as I know hasn’t even been officially released in the U.S. I am among the Tana French fans who yearn for the next book as soon as one is finished. I love the consistency of her inconsistency. I love how the only thing you can count on with French is how you will eventually stumble across the unexpected. She can mix the natural with a hint of the supernatural, the striving to be good with the lapsing into the bad. Rich, poor, lucky, unlucky Toby is our narrator. He was born blessed and cursed by a charm and glibness that hasn’t forced him into understanding his deeper character. Then one day he is attacked, an attack so vicious that he is left with longstanding physical repercussions. His memory and sense of self seem to be faulty. Who is he now that he cannot rely on being what he was before? That may be convoluted syntax, but it is an accurate question. Anyway, French loves the convoluted. While he is recuperating, Toby repairs to Ivy House, where his Uncle Hugo lives, with his girlfriend Melissa. Toby and Melissa are also there to take care of Hugo, who is in the last stages of an incurable illness. Ivy House is where Toby spent his summers with his cousins Susanna and Leon, as his careless parents, aunts and uncles frolicked in sunny climes. Hugo was the preferred de facto parent anyway. As the cousins grew older, teenage bacchanals raged in Hugo’s immense back yard garden. Is it any surprise that in the end the garden itself harbored a terrible secret? The police have been a periodic presence in Toby’s life recently. They are still trying to find out who attacked him. Then other officers and detectives are called in to unravel the secret of the wych elm, the expansive, dominating presence of the garden. The elm has spit out a nasty little bit which must be dealt with by everyone. In a metaphor for Toby’s extended family, I suppose, the elm is cut down in order to examine the diseased parts. Frankly, it’s not so much about the crimes, one of which takes a backseat to the other to the point of almost disappearing. It’s about the people. It’s about whether Toby is an unreliable narrator, so unreliable even he doesn’t realize the scope of his veracity. It’s onion-peeling time for French. And I don’t mean that in a culinary sense. French excels at exposing the past to inform the present. No one is innocent or without a secret. 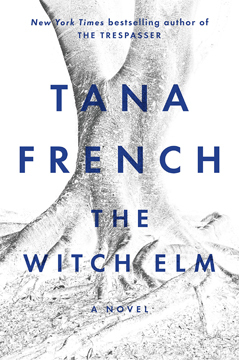 “The Witch Elm” is a long book, and at times I pleaded for French to get to the point. That may say something more about me than French’s writing, however. It is in her nature to paint layer upon layer, so what you expect is turned about by what is next revealed. Where are you now, Toby? Who are you now? In the very end, we must once again adjust what we think we know, and that is French’s ultimate present to her readers. Oh, okay, it’s Tana French, so MBTB star — although, nasty bit that I am, it was too long! George Pelecanos is pretty well known at this point in his career, both as a novelist and as a television producer and writer. His strong suit is depicting life on the tough streets of Washington, D.C., and Baltimore. His characters may appear to be morally ambiguous, but ultimately, they do what’s right. Music and sports provide a backdrop for his characters, giving them a time frame and a culture. 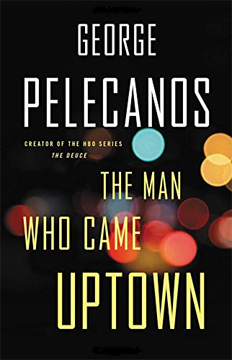 Some of the characters Pelecanos created in other books (Derek Strange, Nick Stephanos) show up here in teasing one-liners, references rather than in the flesh. They all inhabit the same universe. Washington, D.C., at this point is a mixture of the old inhabitants, mostly black, and the new incomers, Latin or middle class white. There is a shift in the economics of some neighborhoods but the criminal element still hides in the shadows. Phil Ornazian is a D.C. private eye. He hustles to keep his family afloat. It’s important to him to provide for his beloved wife and two young sons. And that is what leads him to cross the line one day. He convinces himself that he is more like Robin Hood than a guy robbin’ the hood. He only steals from the nasty and corrupt. The money he gets from stealing a dealer’s cash stash is thus rationalized. Michael Hudson was in jail for a failed armed robbery. While in jail he learned to love reading because of the jail’s excellent librarian, Anna Kaplan. Somehow Ornazian, Michael’s former investigator, manages to get all charges dropped. This time, Michael swears, he won’t disappoint his mother and siblings. He gets a job washing dishes and, although it is boring, he is determined to use it as a stepping stone to staying straight. He uses an empty bookcase to hold his growing collection of books that open his eyes to the nature of human feelings. At a later point Ornazian will come to collect his payment for getting Hudson off. At a later point thoughtful decisions must be made. In the meantime, we get character studies of Ornazian, Michael, and one of Ornazian’s friends, retired D.C. police officer Thaddeus Ward, who now runs Ward Bonds,* a bail bonds place. Anna had her hair down and was wearing mostly black and a pair of distressed short Frye boots. Rick [her husband] was wearing his gear: track pants, a white pullover sporting the Callaway logo, and gray New Balance 990s. Doesn’t that tell you a lot about Anna and her husband and what their relationship must be like? The following morning Terry Kelly woke up to the sounds of his phone alarm and the hard-core thrash of a band called Storm. That’s that loser character in a nutshell. 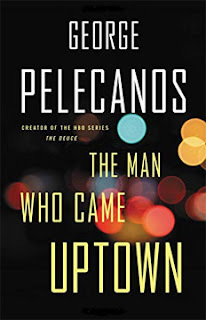 As always, if you love Pelecanos, here’s more of him to love. * Ward (and Pelecanos) shows his age by punning off the name of a long-ago actor, Ward Bond, late of TV’s “Wagon Train” and many Westerns and B movies. Pelecanos likes to throw in jokes like that. Well, I didn’t expect this! After having read “Hope Never Dies” by Andrew Shaffer, which features former President Obama and Vice-President Biden in a mystery-solving caper, and being vaguely disappointed, I expected something similar from “The President Is Missing.” I should not have disparaged the association of James Patterson so blithely. This book was a humdinger and I was vastly more entertained by it than by “Hope Never Dies.” No matter where your political beliefs lie, this book should be a humdinger for you. President Jonathan Lincoln Duncan is only a couple of years into his term when he is hit with the precursor to impeachment proceedings. The opposition-dominated House Select Committee has accused the president of colluding with known terrorist Suliman Cindoruk. His organization, the Sons of Jihad, has avowed the downfall of the U.S. Why would the president be talking to him? In a few days, Duncan will appear before the committee, and he knows that there won’t be much he can say in his defense. Because the situation is dire and a secret and approaching DEFCON 1. And there’s a traitor in the midst. 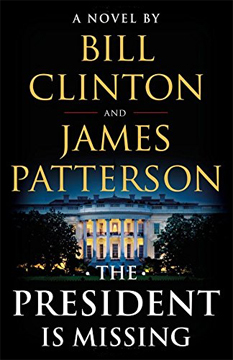 Combining James Patterson’s mastery of the thriller format with Bill Clinton’s familiarity with impeachment proceedings and the routines and terrors of holding the highest office in the land, the two authors seamlessly integrate their strengths into a rapid-fire novel. Yes, I know, it seems contrived that only Duncan can save us. But Clinton and Patterson create a feasible scenario about why the number of people involved must be extremely limited. With limits, of course, comes a higher potential for disaster. Yay! I hope you forget everything I just told you about the plot, because the authors create a tightly written reveal of the situation. The authors cleverly create tension by starting the story off in the dark and only gradually increasing the sliver of light to reveal other facets. Read it. Technical terms are rendered legible. The look behind the White House curtain is delicious. Political intrigue is sadly attuned to the real world, which makes it valuable in its own way. The only part of the book I thought had Clinton’s boot prints all over came at the ending: a speech before a joint session of Congress in which the hopes for the future of the U.S. are delineated. Other than that, it kept to the thriller format and was a triumph of entertainment.